This review first appeared in the September 2009 issue of hi-end hifi magazine High Fidelity of Poland. We publish its English translation in a mutual syndication arrangement with publisher Wojciech Pacula. As is customary for our own reviews, the writer's signature at review's end shows an e-mail address should you have questions or wish to send feedback. All images contained in this review are the property of High Fidelity. - Ed. "01.01.2009 a new person appeared in the company of Struss Amplifiers, a Mr. Jacek Hrynkiewicz-Struss (36-year old son of Zdzisław Hrynkiewicz-Struss). The son took over manufacturing and marketing. This meant that manufacturing was transferred to Bielsko-Biała. Mr. Zdzisław Hrynkiewicz-Struss is still dealing with designing new products and providing service." That information was published some time ago in our news section. For those not dealing with audio—particularly Polish audio and over a long time—this wasn't a very important news item. 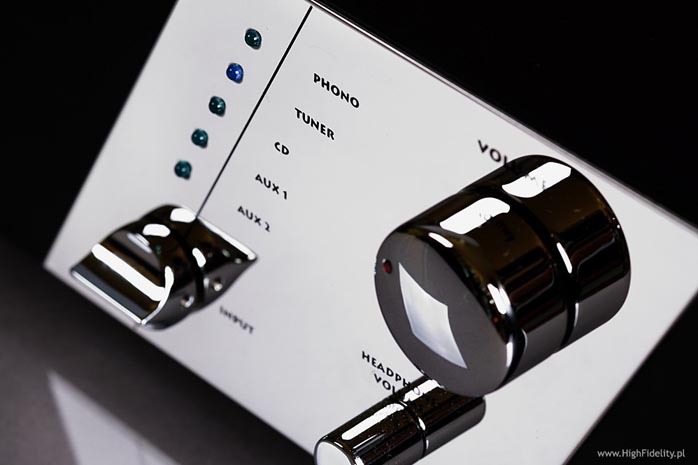 But for me it was key to the remainder of the blurb which described the construction and background of their newest amplifier called Chopin MkIV. 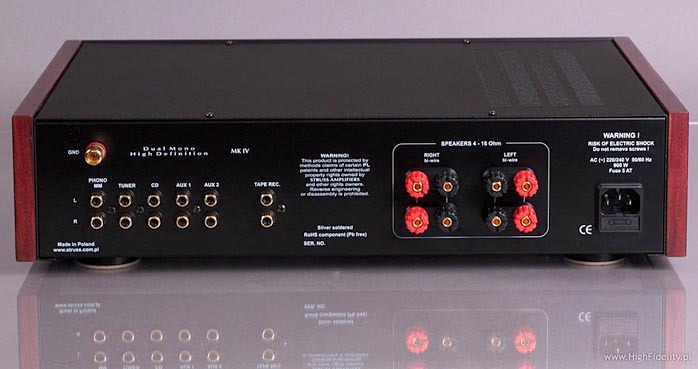 I first came across an amplifier from this Pruszków-based company in 1997 after reading the magazine Hi-Fi i Muzyka and looking at its picture on the cover. In that magazine, this model was very well received and remained in the editorial office as reference amplifier where the ‘140’ replaced the first amp Struss had ever produced, the quite ugly 01-2. Looking at the design of the 140 amplifier and studying its catalog data including its substantial power of 140W/8Ω, I could appreciate these events. At the time I was working as an acoustics engineer in Krakow's J. Słowacki theatre and power to me meant quite a lot – the stage loudspeakers were powered by over 20 kilowatts. It quickly turned out that this wasn’t to be my last meeting with the Struss Amplifier company. At the same time, my brother bought the 140 for his system and I changed employer and started work for the distribution company Audioholic where we sold, among other things, the Struss models 140SE, 140L and 140S. So I developed quite close and extensive contact with these products to form my own opinion about their published reviews and the specific things the maker wanted to achieve. To keep things brief, it wasn't 'my' kind of sound. One of the basic Struss notions incorporated since the very first model is a distortion reduction system called Distortion Free Power Supply. And truly the sound was clear and free from the sandy treble that quite often accompanies powerful amplifiers. As things went, this was to be my last contact with the Struss company for almost ten years. 2.Replacement of transformers for units using Danish cores. 3.The construction was rigidified by adding copper inserts below the transformers. 1.Replacement of the cable between input selector and potentiometer to Gotham GAC1. 2.Replacement of volume potentiometer to Alps Blue Velvet. 3.Replacement of electrolytic capacitors to the exclusive Jamicon 'for audio' HT105, 835k0(M), 4x22 000 μF. 4.The headphone amplifier was modified to work with headphones of low impedance. 5.Changes to the MM phono stage. 6.The bias of the output transistors was increased. 7.The paths of the loudspeaker outputs were shortened by half. Due to those actions the operating parameters of the amplifier changed. It is known how reviews in quality magazines can have a big impact on manufacturers. A reviewer is in fact a qualified—I assume that optimistically—beta tester who will encounter problems and has access to vast comparative data (yes, I do believe in people). As such, the critical review process is valuable for all manufacturers but not everybody admits it, fearing it might suggest incompetence on their part. This is not true. If the review was conducted according to the rules, if it was fair and the reference system much better than the tested product, then it was just another step in the ongoing and never-ending process of refining the product. This is why I understand Mr. Jacek's iterative process and admire his honesty. Today's test was conducted with two sets of speakers – the large full-range Dobermann Harpia Acoustics and the small, and paradoxically more difficult-to-drive Spendor SP1. Headphones were by AKG, Ultrasone and Beyerdynamic as described later. Unfortunately I had no MM or MC high-out cartridge on hand—only MC—so I did not test the phono input. Apologies for this omission. Wes Montgomery, So Much Guitar!, Riverside/Universal Music Japan, UCCO-5103, CD. The Doors, L.A. Woman, Elektra/Warner Music Japan, WPCR-12721, CD. Depeche Mode, Sounds Of The Universe, Mute/Emi Music Japan, TOCP-66878, CD+DVD. The Beatles, Beatles For Sale, Parlophone/Apple/Toshiba-EMI, TOCP-51114, CD. John Coltrane, Lush Live, Prestige/Universal Music Japan, UCCO-9255, CD. Carmen McRae, Book Of Ballads, Kapp Records/Universal Music Japan, UCCU-9634, SHM-CD. The Oscar Peterson Trio, We Get Request, Verve/Lasting Impression Music, LIM K2HD 032, K2HD. Danielsson/Dell/Landgren, Salzau Music On The Water, ACT Music+Vision, ACT 9445-2, CD. e.s.t., Viaticum, ACT Music+Vision, ACT 6001-2, CD. Kate Bush, Aerial, EMI, 43960, 2 x CCD.